cardigans and kids: roses in the spring. 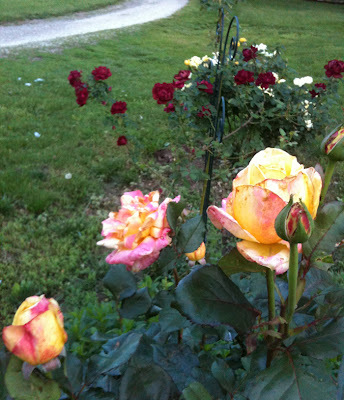 Last Fall I moved my rose bushes to the north side of our property. They are surrounded by mint and soon, I am sure a tomato plant will be tall enough to see coming up along side the roses. If I were to start adding some of the things I learned over the last almost 38 years, planting rose bushes and tending to flowers or plants would have to be on that list. Not only do they look beautiful - even a well-tended garden is lovely, but the few (or many) minutes spent tending to them always are good for the soul. The mint goes in my ice tea all summer, and vegetables from your garden are far better then from the market. And flowers on a counter or table are a gift for all who seem them and smell them.